When it's time to slide down the rope, you need to have as much confidence in your fastroping gloves as you have in your team and your gear. 5.11's redesigned FASTAC 2 gloves provide enhanced fit and more knuckle protection and we've upgraded the leather for more pliability and dexterity. With one layer each of tough goatskin and cowhide leather at all the rope contact points, and a highly breathable Breathoprene and nylon/Spandex stretch back panel, we've minimized the heat you'll take on the way down the rope. 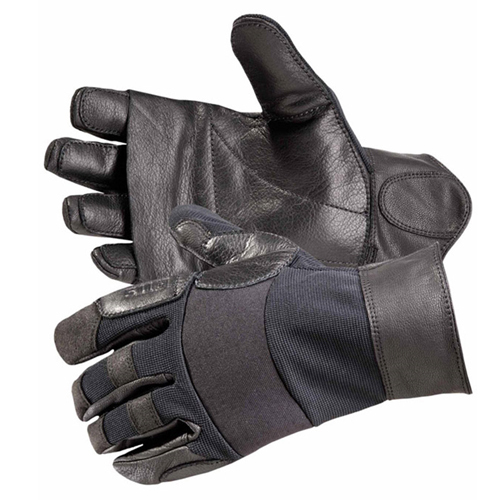 The goatskin finger facings and saddle between the thumb and index finger are also reinforced with a layer of cowhide for added protection. Our FASTAC2 gloves feature longer wrist-cords with locks to keep your gloves at hand until you're ready to drop them at the end of the rope. If you want to wear our FASTAC2 gloves over another pair of tactical gloves, we suggest our Tac AK2 or Tac NFO2 gloves and remind you to buy the FASTAC2 gloves one size larger than you normally wear.